It is a NEW service; not a revision for the sake of being different, nor a translation of old forms into modern language; therefore worshippers are urged not to compare it with older, familiar orders of service, but to judge how it achieves its object. The service rises from a PENITENTIAL beginning, through INSTRUCTION, INTERCESSION, and THANKSGIVING, to the ultimate COMMUNION of the whole church with God; to the DISMISSAL to serve Him in the world with renewed vigour. CONFESSION and ABSOLUTION come early in the service and after this all people are reconciled, one with another, by the exchange of the PEACE (or PAX). The PAX is the mutual greeting of the faithful in the Eucharistic Liturgy, as a sign of their love and union, and is probably of Apostolic origin (Romans 16.16; 1 Peter 5.14). The original form has been modified in all rites and it is suggested that the clasping of hands is the most convenient method, done either in silence, or accompanied by the words “the Peace of the Lord”. The celebrant will greet the Deacon or an assistant who will then proceed to the nearest member of the congregation, who will in turn pass on the action through the congregation. The MINISTRY OF THE WORD provides for instruction in the form of the reading of God’s Word and in the preaching of a sermon or a homily. The use of the New English Bible, or Phillips’ version of the Epistles is recommended, but not mandatory. The INTERCESSION provides the opportunity for the congregation to bring before God their needs, and the needs of the world. It is intended that congregations be encouraged to submit their petitions to the Priest or Reader in advance of the service. (In practice this may be desirable on the day preceding). The OFFERING and GREAT THANKSGIVING come as a natural progression and provide opportunity for the whole congregation to express their thanks to God and to dedicate themselves anew. Following the climax of the COMMUNION the brief but vital DISMISSAL affirms the eagerness of the communicants to serve the Lord in the world. (3) specific lay participation may be introduced to a greater or lesser extent, dependent upon availability of capable lay persons, and the size of the congregation. Participation of the congregation as a whole conveys the essentially corporate nature of Communion. (4) Silence is an important element of this Liturgy, and from time to time the Priest ought to give guidance to the congregation in the creative use of silent prayer. New wordings of the Nicene Creed and the Gloria in Excelsis used in the Qu’Appelle Liturgy are those prepared by the major liturgical commissions: the International Lutheran Commission on Worship; the Commission on Worship of the Consultation of Church Union, representing nine major bodies seeking union, including the Episcopal (Anglican) Church; and the Roman Catholic International Committee on English in the Liturgy. This liturgy was authorized in 1969 for use in the Anglican Diocese of Qu'Appelle, a diocese of the Anglican Church of Canada situated in the lower third of Saskatchewan. The Diocese of Qu'Appelle was established in 1884; it received substantial early support from the Society for the Propagation of the Gospel in Foreign Parts, unlike the northern dioceses of the province, which received such aid and personnel from the Church Missionary Society. The Qu'Appelle Liturgy — an early part of the process of liturgical revision that culminated in the 1985 Book of Alternative Services — was published during the tenure of the seventh Bishop of Qu'Appelle, George Clarence Fredrick Jackson (1907-1990, diocesan bishop 1960-1977). The influence of the Qu'Appelle Liturgy is notable today in A Melanesian English Prayer Book, where the words of administration of Holy Communion follow the Qu'Appelle model closely in including the phrase "Do this and know that I am with you." 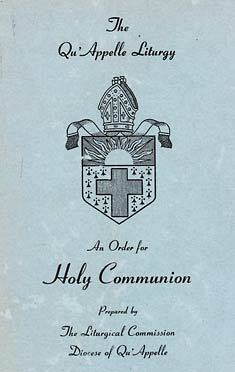 While developed for one diocese, this Liturgy was authorized for use in much of Canada. The text presented here was transcribed by Richard Mammana from a twelve-page booklet printed in March 1970. Thanks are due to Thomas Rae, who supplied a copy of the booklet. The Service, up to and including the Intercession, may be said in the nave or chancel of the church, and, with the exception of the Absolution, may be conducted by Lay persons. The Preparation is a penitential approach to the Sacrament and should NOT be preceded by the singing of a hymn. One or more of the following sentences will be read. Reader: Thus says the high and lofty One who inhabits eternity, whose name is Holy: “I dwell in the high and holy place, and also with him who is of a contrite and humble spirit”. I will arise and go to my father, and I will say to him, Father, I have sinned against heaven and before you, I am no more worthy to be called your son. Seek the Lord while he may be found, call upon him while he is near; let the wicked forsake his way, and the unrighteous man his thoughts; let him return to the Lord, that he may have mercy on him, and to our God, for he will abundantly pardon. To the Lord our God belong mercy and forgiveness; because we have rebelled against him, and have not obeyed the voice of the Lord our God by following his laws which he set before us. And to lead the Christian life. The people having made their self-examinations beforehand, a period of silence shall be kept for recollection, after which the Confession will be said together. And keep you in eternal life, through Jesus Christ our Lord. As a sign of reconciliation, the PEACE may be exchanged with a handclasp, or in the case of a small child, a hand placed on the head. Then shall be said or sung Gloria in Excelsis. On a weekday which is not a festival it may be omitted. peace and grace to his people on earth. you take away the sin of the world: have mercy on us. You sit at the right hand of the Father: hear our prayer. in the glory of the Father. Amen. If a lesson from the Old Testament is read, it may be announced thus: “The lesson is written in (book) . . . . . . . (chapter) . . . . . . . beginning at verse . . . . . . . The reading of the Epistle may be announced thus: “The Epistle (or lesson) is written in (book) . . . . . . . (chapter) . . . . . . . beginning at verse . . . . . . .
Where there is no sermon a short homily will be read. On Sundays and other Holy Days, the Creed will then be said or sung. God from God, Light from Light, true God from true God: begotten, not made, one in being with the Father. For us men and for our salvation he came down from heaven. He was crucified for us under Pontius Pilate; he suffered, died and was buried. He arose on the third day in accordance with the scriptures. He entered into heaven and is seated at the right hand of the Father. Together with the Father and the Son he is adored and glorified. We believe in one, holy catholic, and apostolic Church. We look for the resurrection of the dead and the life of the world to come. May we be united in your truth, live together in your love and show your glory in all the world. Here he may pray for the Church throughout the world, and especially for the Diocese and its Bishop, and any particular needs of the Church. A short period of silence may be kept. Reader: Direct the nations that all people may enjoy the blessing of freedom and peace, and grant that in our various callings we may serve you and our fellow men. Here he may pray for the nations of the world, and especially for this country, and for all men in their various occupations. A short period of silence may be kept. Reader: We pray father for . . . . . . . . Here he may present any special intention or prayer. A short period of silence may be kept. Reader: Remember, Father, your servants who have departed this life, and grant them a share with the saints in your eternal kingdom, through the merits of Jesus Christ, your Son, our Lord. Here he may commend the dead by name. A short period of silence may be kept. Reader: Grant these our prayers, Father, for the sake of your Son Jesus Christ, who lives and reigns with you and the Holy Spirit, one God for ever. The offerings of the people—bread, wine and money—will be made here. This bread, this wine, this money. With them we offer ourselves, our lives and our work. Priest: Let us give thanks. People: We give thanks to the Lord our God. O Lord, Holy Father, Almighty, Eternal God, Creator and preserver of all things. Here an appropriate preface may be said. The highest glory is yours, O Lord. The highest glory is yours. We thank you for the gift of your Son, Jesus the Christ. We give thanks that he has become one of us, sharing our life. We give thanks that we are becoming one with him, sharing his life. The Holy Spirit of love and peace and strength. We praise you, our Father, throughout all ages, World without end. People: It is a sharing of the Blood of Christ. Priest: Draw near and receive the Body and the Blood of our Lord Jesus Christ which was given for you, and feed on him in your heart by faith, with thanksgiving. Then shall the priest first receive Communion in both kinds and then shall proceed to deliver the same to those present. Praise the Lord for the Lord is good. People: To you, O Lord be glory for evermore. Be the Church in the world.